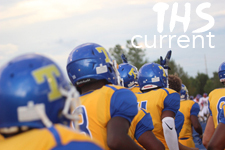 Hi, I’m Jordyn Smith and this year I am a sophomore at Tupelo High School. I tried to be funny but then I realized I wasn’t so here you go: I don’t play any sports so the only other obvious solution of what to do with my time would be to watch Netflix! Well there are a few other things that I do, such as eat and sleep. I guess I’m pretty involved in the school, I mean I go everyday. All jokes aside though, I do try to get involved by joining clubs such as DECA, student council, and National Honor Society. And remember, if someone gets too annoying, defenestration (look it up) is never out of the question.